Heading up north to the cabin is such an integral part of life in Minnesota. The tranquility and seclusion of the woods offers an excellent escape from the hustle and bustle of everyday life. Even though Ernest Thompson’s 1978 play “On Golden Pond” is set in Maine there is a natural connection with the ambience of Minnesota’s lake country. In fact, the dialogue for Yellow Tree Theatre’s production has been tweaked to reflect taking place in Northern Minnesota. 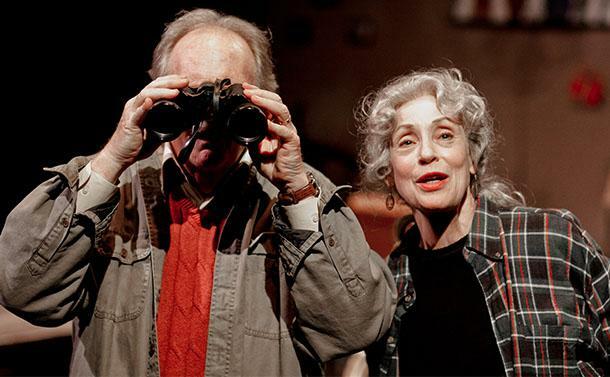 For the last 48 years, Norman and Ethel Thayer have been making the trek from their home in Ames, Iowa to their summer home on Golden Pond. Portrayed by real life married couple Katherine Ferrand and Jon Cranney they are so natural in the roles of Norman and Ethel you feel as though you are eavesdropping on their summer at the lake. From their good natured jabs to the endearing glances they give each other, their chemistry is undeniable. They are the heart and soul of this production. It doesn’t take long for us to realize this summer is different for the Thayers. Not only is Norman turning 80 years old this summer, but he is suffering from the early symptoms of Alzheimer’s and has a heart condition as well. Norman’s impending birthday prompts a visit from his estranged daughter Chelsea with her fiance and his 13 year old son in tow. The strained father/daughter relationship is a main focus of the summer. Upon Chelsea’s arrival it appears the root of the conflict is Norman always wanted a son. This is even more prevalent when Chelsea’s soon to be stepson, Billy, Jr. is left with Ethel and Norman for a month. He and Norman become fast friends and bond over fishing, hi-jinks and other cabin activities. George Marsolek’s set design works perfectly in the small space. Full of common cabin accessories — games, books, loon figurines and fishing paraphernalia. In addition to starring as Norman, Jon Cranney also directs the production. He geniusly has used the intimate space to his advantage with the staging of this production. The staging and intimacy of the seating arrangement adds to the feeling of eavesdropping on Ethel and Norman’s summer at the lake. “On Golden Pond” continues at Yellow Tree Theatre in Osseo through October 13. For more information or to purchase tickets visit Yellow Tree’s website.